Florence Harbor, who is 85 and has lived on the west side of the railroad tracks in this village for decades, had a stroke in early May. Because a mile-long tanker train carrying crude oil from North Dakota to the Port of Albany was stopped on the tracks, blocking both railroad crossings that are the only regular street access to the neighborhood, the ambulance couldn't get to Harbor's home. Minutes ticked by as the ambulance circled, finally coming in the back way, through a locked gate at the top of the Menand Road hill, where it ends at Route 378. A new bill introduced by local members of the Assembly would boost the fines for such blockages from $100 per occurrence, as the penalty has been for many years, to $5,000 for the first offense, $25,000 for the second and $75,000 for the third. The measure is one of a suite of bills introduced to address issues related to the transport of crude oil through the Capital Region. 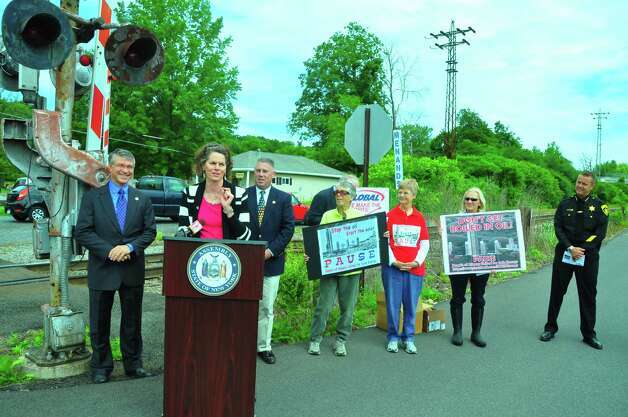 Assembly members Patricia Fahy, D-Albany, John T. McDonald III, D-Cohoes, andPhil Steck, D-Colonie, discussed their bills at a news conference Saturday held at the railroad crossing at Menand Road and Railroad Avenue near Harbor's home, which was blocked by an oil train the day she had a stroke. Harbor has recovered, but the next time she had a medical emergency "We just put her in the car and took her (to the hospital) ourselves," said her daughter Laura Harbor, who lives near her mother, also on the west side of the tracks. "We didn't want to risk a train coming through while we were waiting." Since the oil boom in the Bakken shale deposits in North Dakota, Capital Region residents from Cohoes, Watervliet, Menands and Albany have noticed a sharp upsurge in train traffic carrying the volatile crude oil to the Port of Albany, where the two companies that handle it at the port have state permits to process up to 2.8 billion gallons annually. Oil from Bakken wells, which are producing an estimated 1 million barrels a day, according to energy-industry figures, has been the cargo of trains involved in derailments, collisions, leaks and explosions that have killed more than 50 people, the evacuation of thousands and the spillage of more than 3 million gallons of oil in less than a year. With trains running through local neighborhoods approximately every three hours or so, day and night, about four to five times more often than just three years ago, residents and officials are increasingly concerned about the safety and regulation of the trains. An explosion in July 2013 in Lac-Megantic, Quebec, devastated the town, killed nearly four dozen people, leaked 1.6 million gallons and will cost an estimated $2 billion to clean up. "It is imperative that rail traffic remain safe and have minimal impact on the safety and well-being of the residents and the environment," said McDonald, who was mayor of Cohoes for 13 years before being elected to the Assembly in 2012. In May, Gov. Andrew Cuomo received a report from the state Department of Environmental Conservation and other state agencies on the risks of crude oil transport, and he has urged stricter standards by the federal government, which oversees rail transportation. Give the federal jurisdiction, "There's only so much we can do on a state level," said Fahy. But, she said, the bills she is co-sponsoring would take important steps toward protecting people, communities and the environment. One bill addresses penalties for railroad crossings that are intentionally or recklessly blocked for more than five minutes, and would allow anyone harmed by such a blockage to sue. Another concerns storage facilities for bulk crude oil. An additional bill, still being drafted, would increase the state oil-spill fund, which stands at $25 million. Pointing to the massive cost of cleaning up the Quebec disaster from last summer, Steck said he believed the fund, which would be paid for by taxes on the transport of oil through the state, should be at $2 billion. Only one of the bills has a co-sponsor in the state Senate. Noting that there are just four days left in the current legislative session, due to end Thursday, Fahy said she hoped some of the measures would be voted on in the coming days. Those that aren't passed into law will be a top priority in the next session, she said.